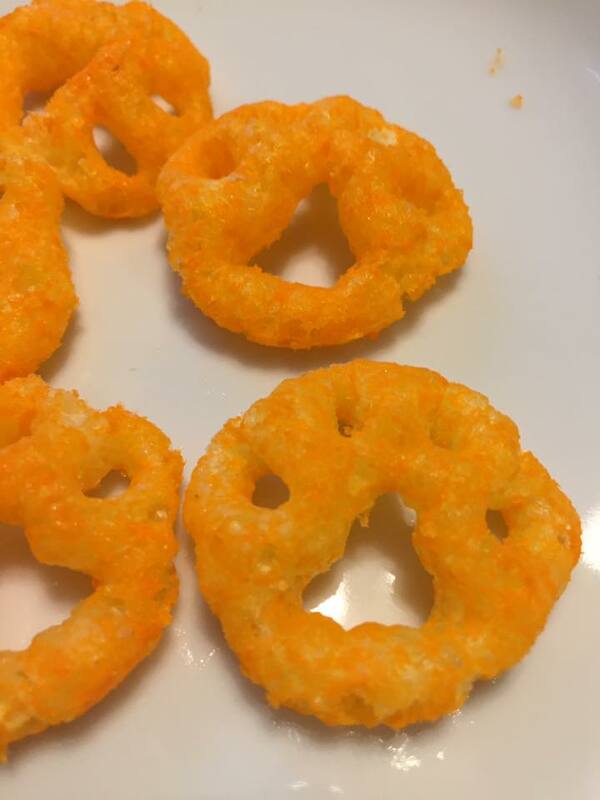 The Horror Movie BBQ: Cheetos Paws Are BACK, BABY! Then, it was Ecto Cooler's turn.. It was only a matter of time until one more piece of the nostalgic junkfood puzzle was to be filled. Now, if you're thinking I'm talking Ninja Turtle Pudding Pies, sorry, I'm not. Even though those had a permanent spot in my lunchbox for the year or two they were available and I did love those, I'm referring to a snack that was around longer and that I have a lot more affection for. I'm talking about...CHEETOS PAWS!!!!!! Look at it. It's here. Live and in living color. Never in a million years did I think they would come back. We had been teased by Cheetos Halloween offering, Bag of Bones, which actually contains the Paws themselves and had that same crunch, but being a white cheddar flavor, it's a nice effort but it's not the same. I will say, the white cheddar is pretty darn delicious and can't suggest those enough! Just a quick rundown. 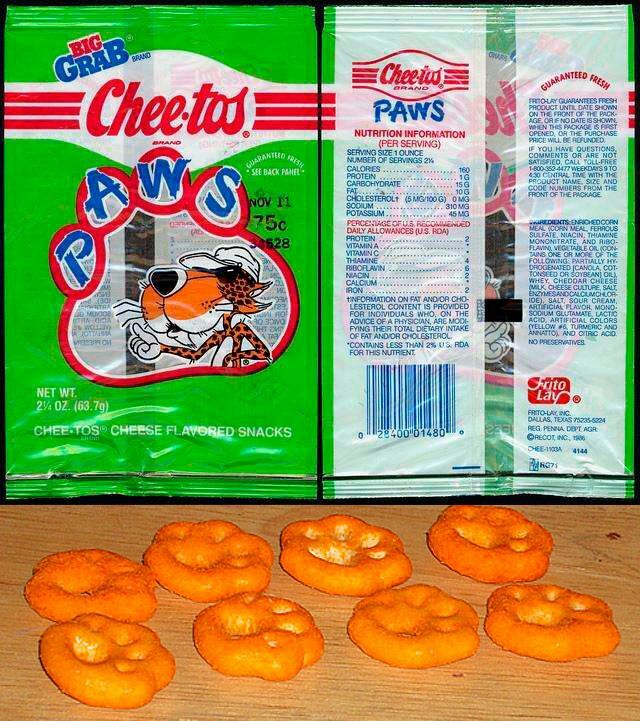 Cheetos Paws was offered from 1990-1993 and in that small time it left a huge impact on anyone who ate them. Why? Look at them! THEY'RE CHESTER'S PAWS! You're essentially eating Chester, which admittedly, these are healthier and less cruel than actually eating an animated, skateboarding Cheetah, but that's neither here nor there. 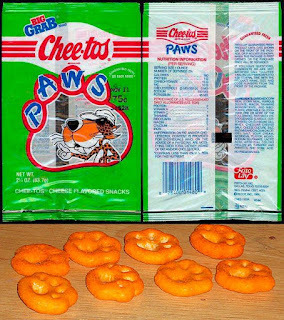 These were also one of Cheetos first varieties, after the Paws experiment was through, we'd get X's And O's, Checkers, Twists, and other crazy shapes. But The Paws? Those were what we really wanted. I can't count how many times I sat in front of my couch with an Ecto Cooler, and a bowl of these and Ninja Turtle Crunchabungas mixed together while watching TGIF or Saturday Morning cartoons in that 3 years. I loved everything about these. 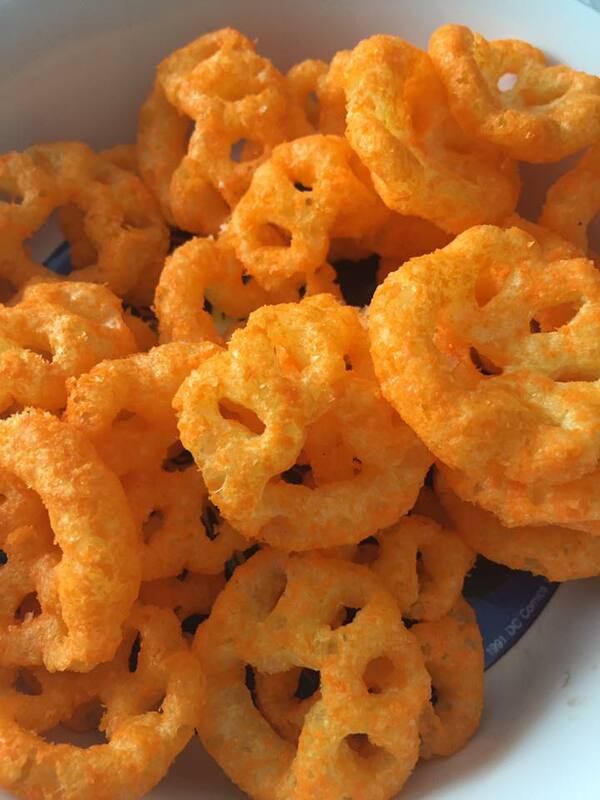 Cheetos always seemed like an awesome snack after school, but turn them into Paws and I want them even more. But the appeal wasn't just their shape but their taste was different. They were a little bit of a mix between the regular puffs and the crunchy Cheetos themselves, which is pretty good if you consider sometimes you just want both but maybe you just have one bag in the pantry. This solved that. Why just have one when you can both in one tasty crunch? Now, let's catch up. Does it taste the same? Does it LOOK the same? Certainly the bag doesn't look the same. Although I would love that lime green bag back. That thing was sweet looking. It's very early 90s. Just looking at the bag itself sends me back to watching Full House and Family Matters. Well, I guess there's only one way to truly get the full experience. Gotta get some Ecto Cooler! The Paws are a tiny bit different looking. The original Paws were flatter but these have a slight curve to them. They're more like lighter rib-cages used in the Bag Of Bones I previously mentioned. On top of that, the Paws offered in that same bag are more accurate to the original form and crunch. That said, I'm not bothered by it because the taste is still there. They're a bit airier than the originals as well which means the crunch isn't the same. Is that a disappointment? No. I'm all in on these. I'm just happy they're back, hopefully all year round, It's pretty cool to see them on the shelves for a whole new generation to have the same memories of being lazy after school that I did. So while it's not exactly the same as I recall them to be but it still gets my seal of approval. I definitely enjoy them and they do make a nice side dish alongside of a sandwich. In fact, I may have to just put a bowl together to watch Full House tonight. Feels right, no? 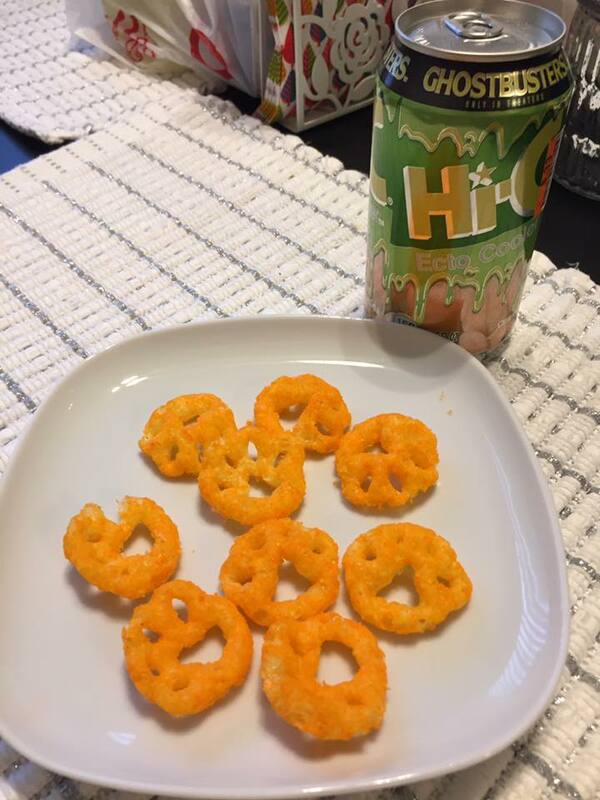 Cheetos definitely pulled out the favorite of many millennials to enjoy once again and for that, I tip my hat to them. 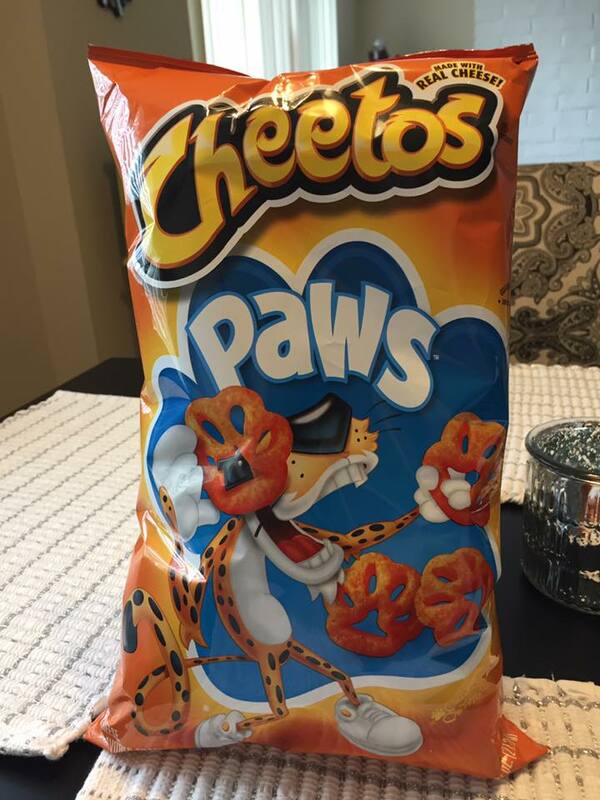 It's really the experience of holding the bag and seeing "CHEETOS PAWS" emblazoned on the bag while Chester devours his own hands. Which is an odd visual but Chester is an odd dude himself. Dude your my hero. I was gonna say I just wish I had an ecto cooler to go with it and you took the words out of my mouth.